Chris reviews the latest buffed-up RPG from Beamdog; the masterpiece that is Planescape: Torment. How do you write a review for a game you’ve adored for almost half your life? How on earth can anyone separate years of nostalgia and fandom when attempting to reevaluate a title you have in many ways grown up with? When initial opinions are formed so long ago and become cemented, can anyone really look at something beloved afresh and uncoloured by previous experiences? The answer is clearly: no. To claim otherwise is not only disingenuous, but fundamentally disrespectful to you dear reader. So, here I lay my cards on the table. Planescape: Torment is without a doubt my favourite game of all time. It has remained in this position since its release in December 1999. And while there have been contenders for the crown, it has to this date not been dethroned. With the assistance of original lead designer Chris Avellone, Beamdog has released an Enhanced Edition of the now-iconic game. This new edition has only further cemented Planescape's top position in my mind. Having said all this, I know there is little value in the above statement, steeped as it is in personal nostalgia. So, what follows are the reasons why this game in its current incarnation is in many ways the single best RPG ever made, and why many of you will find it nothing more than a clunky, long-winded, and archaic waste of time. You see, despite my wishing otherwise, the '90s are well and truly over. Planescape: Torment was something of a revelation back in the day. Rather than the combat-heavy hero versus god construction most RPGs had embraced in the prior decade, it trod a less travelled road – one that paved the way for RPGs to tell more personal stories and move away from the "kill bad guys to win" design ethic that in many ways still dominates the genre even today. You play as the Nameless One, an apparently immortal man of unknown origin who must re-discover who he is, and why he is cursed with eternal life. Along the way, he encounters friends and enemies, both living and long-dead, who reveal not just one life lived, but many. These lives, awesome and terrible, all weave a tapestry of choice and consequence leading to a singular question: what can change the nature of a man? 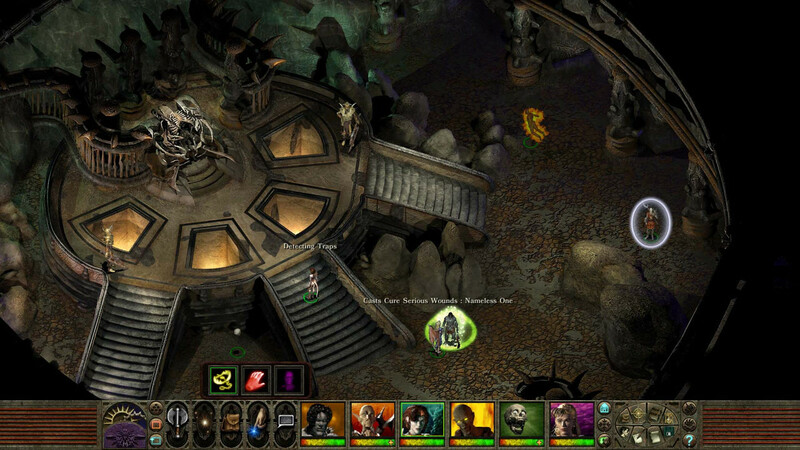 Gameplay wise, Planescape is very much a product of the 1990s, featuring a 2D isometric perspective with character sprites in lieu of high-polygon models, and drawn static backgrounds with minimal animation to give the impression of a "living" landscape. With a fixed camera, it feels very restrictive compared to modern RPG titles. New enhancements by the Beamdog team have helped to smooth things out, but this is obviously an older game. A beautiful older game no doubt, but no amount of linear filtering can really hide that fact. The ability to zoom in and out, and the fact that the game will now render at your monitors native resolution allow the at-times stunning level art to really shine in a way it never could before (outside of modding the hell out of it). Mechanically, it works as you would expect; there's pointing, clicking, space bar pausing, and a lot of reading. And by a lot, I really mean a lot. 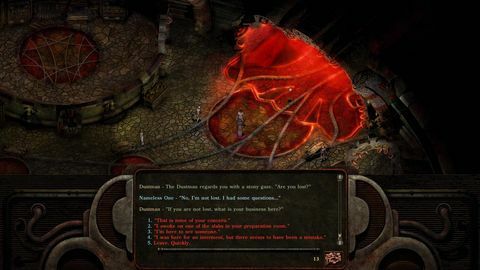 Planescape: Torment is a game build around characters, and the tales they tell are at the core of the experience. How you interact with the various characters and your own party members affects their story arc within the Nameless One’s personal journey. So, a veritable forest of dialogue trees await those looking to get lost in a world of the written word. Voice acting is virtually non-existent, and clear choices are seldom found. This is game about as far from the modern experience as you can find, and is both its greatest strength, and biggest issue. The writing is without peer, the finest example of adult storytelling in gaming. That is in spite of its fantastical and often downright peculiar reality-shifting setting. This is a character-driven game, where the critical path is forged by the story. Everything Chris Avellone has built here is to service the story he wants you to uncover and explore. In many ways the game is linear, but the conversational choices and NPC interactions can and do affect the Nameless One’s journey and evolution in fundamental ways. Just as it is with most other RPGs, Planescape is about discovery. The key difference here is that you aren’t seeking the discovery of new lands, or the revelation of the "big bad" – this is a discovery of self, and the game is all the more rewarding for it. Potential issues for players not only come in the form of imposing walls of text, but in the less-developed aspects of the game. Combat, while it is kept to a bare minimum, it was obviously not something given a lot of time in the design phase. As wonderful, complex and nuanced as the writing is, the combat is anything but. It's a less engaging, and rather shallow version of the 'real-time with pause' combat found in all of the Infinity Engine games. That is not to say it doesn’t work, but there is no real depth to it, and it can end up being a whole of spamming certain attacks, or almost broken over-powered skills and/or spells. Every time you enter combat it feels like a missed opportunity, or perhaps something that should have been left out of the game entirely. That makes it one area that could have dearly done with some actual enhancements, but I respect the team’s decision to leave it as it was originally designed, and spend their efforts on fixing and polishing everything they could within the confines of the original design. That isn’t to say they haven’t also fixed many of the games quirks and rougher edges. Along with wide-screen and higher resolution support, the UI has been given a much-needed update that nevertheless remains very true to the original vision. Most notable is the excision of the right-click pop-up interaction menu, and its reintegration into the main UI. There have also been a slew of big fixes, grammar corrections, and all the requisite upgrades to the engine to ensure it works on modern machines, as well as a few nice "quality of life" improvements like a highlight interactive objects function, and a quick loot button. The music sounds much better than before with a definite increase in fidelity, and it is as wonderfully unique and just as evocative as ever. 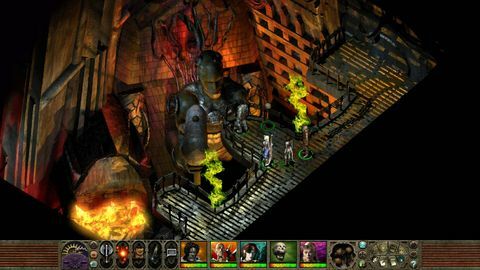 Planescape: Torment is a strange beast, and that really is part of its charm. The question now though is: does this reworked 18 year old game deserve your money? And perhaps more importantly: does it deserve your time in 2017? The answer is an emphatic yes, and also a rather disheartening no. Planescape: Torment is the single best example of the narrative-driven RPG. However, it is so far over in that camp that anyone looking for a fantasy romp, an epic heroic adventure, or a more combat and action oriented experience will likely find this game hard to enter. That entry is also hampered by some core mechanics and design pillars not seen in a couple of decades, or outside of nostalgia-driven crowd-funded titles. However, those willing to try a different type of RPG and give it the time it deserves will find something very special indeed. If there ever was a game deserving of a traveller's advisory for would-be adventurers, this is it. In short, I adore this game. Some might hate it, and I can't fault them for it, but I hope I’ve provided enough insight so others can buy with some degree of confidence. Ups Story and characterisations are second to none. Wonderfully strange setting is still compelling almost two decades later. The earie and evocative soundtrack has never sounded better. A massive ocean of text to spend hours exploring. Downs Combat still feels like an afterthought, and could be a deal breaker for many. Despite some stellar work on bringing the game up to modern standards its age is certainly showing. A massive ocean of text to potentially be overwhelmed by.